This mustard recipe is made with whole brown and yellow mustard seeds along with white wine and wine vinegar. It's basically a variation on the classic Dijon mustard, and it's blended so that it has a slightly crunchy texture. 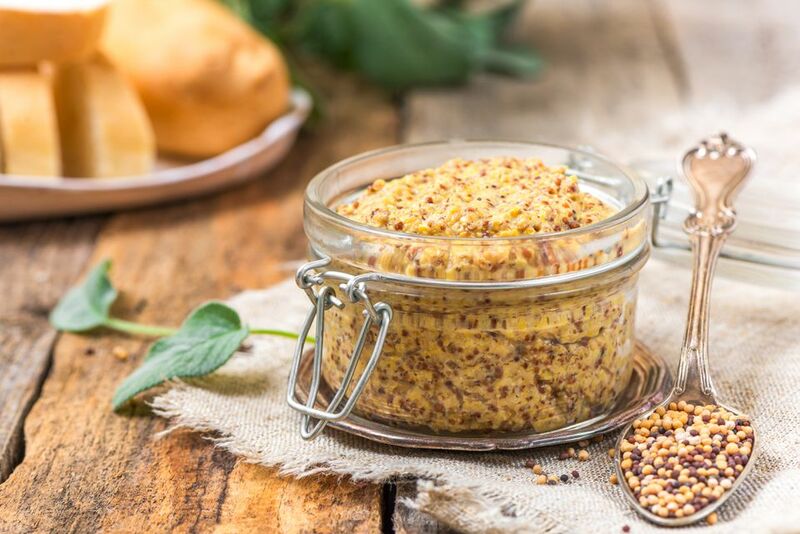 You'll need to soak the mustard seeds for 48 hours before starting the prep, and the finished mustard needs to refrigerate for another 24 hours to stabilize, but the actual prep time is more like 30 seconds. Combine the mustard seeds, wine, vinegar and sugar in a glass bowl. It's important to use glass because the acid in the wine and vinegar can react with certain kinds of metal and produce an off taste. Cover with plastic wrap and let sit at room temperature for two days. Transfer the contents to a blender, along with the salt, and blend until you achieve the desired consistency. 30 seconds should be about right. Transfer back to a glass jar with a tight-fitting lid and refrigerate for another 24 hours before using. The mustard will keep in the fridge for a couple of months as long as it's tightly covered.